Today/tonight is the big match: USA vs. Belgium. As it happens, I’m in Belgium while my family is back in Cincinnati. 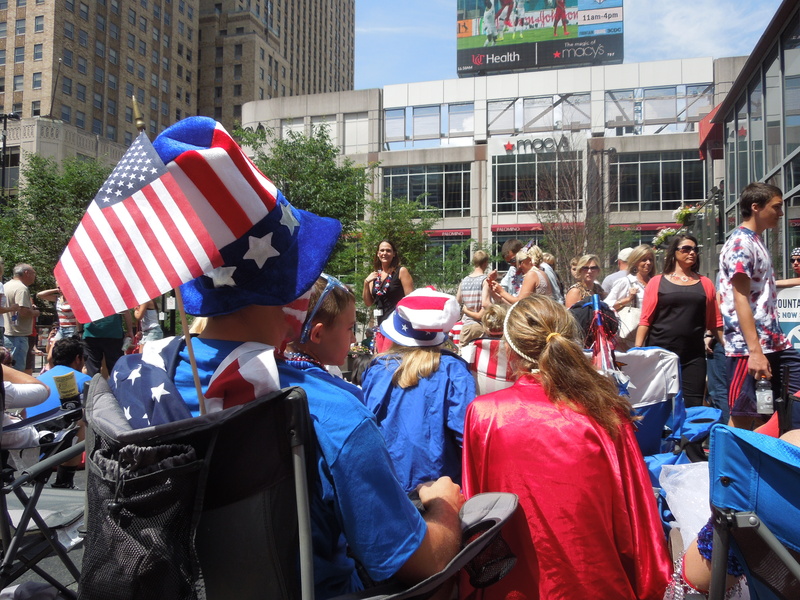 They are watching the game from Fountain Square where everyone is donned in red, white and blue and the game is showing on a big screen. In Brussels, they are showing the game on big screens at the stadium. I can’t get there, but have my choice of bars to go to. The question is, dare I wear red, white and blue? 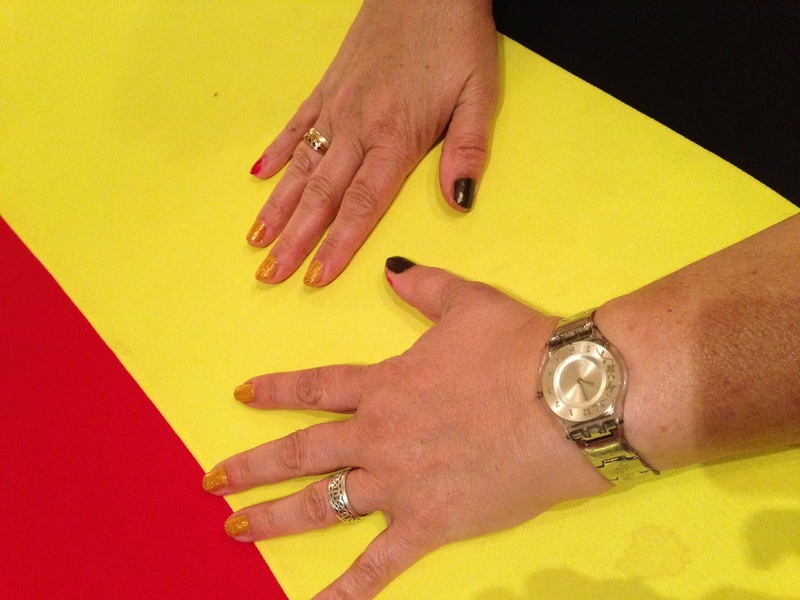 Belgian colors on the tablecloth and fingernails. To see more posts about World Cups, check out Where’s My BackPack. I hope you wore something that was red, white and blue. I heard USA played well! I chickened out. I was the only American in the bar and the only red, white and blue I had with me was an American flag scarf. That seemed like I was going a little too far. That was an absolutely fantastic match – I hope you found somewhere fun to watch it! Absolutely heartstopping. Tim Howard deserves some kind of medal. He certainly does! The whole game was down by the US goal box. He fended off a lot of goals. The last 30 inutes were nail-biters. Kerry, I love it! One goalie did that during one of my daughter’s games. She didn’t kick her teammates in the shins, but she did come out of the box and nearly scored. Eh, it’s just soccer. Wear whatever. No. Which was just as well since we lost. Oh I am sorry you did not pin your colours to the mast!There is nothing but praise for the USA team today, and they have a superb goalkeeper! I live in Ireland where team colours are a huge part of life. It is not unusual here to see a lone supporter wearing a particular team colour in a sea of colour supporting the opposite side. I remember seeing that quite vividly when I was in Ireland. Everyone was dressed to match their hurling team and flags flew everywhere. Great team spirit! Yes – and it it occured to me after I replied to you, that perhaps such practices are not always wise, especially where there is fierce rivalry (and worse) between different teams. It is safe to do it here in Ireland!. Ahh I missed the match, but I did watch the score on my phone app ! They should go home proud. They’ve done better than everyone expected. Yes. They did much better than even their own coach expected! HIs comments before their first game did not go over well in America. In case you’re in a part of the world that didn’t hear about this, he said Team USA didn’t have a chance of winning the World Cup. Pretty un-American attitude. I presume he was just being very direct, which is how the Germans are …. but I know what you mean ! There have been some great matches in this World Cup, much more so than four years ago. That USA v Belgium game was extraordinary. Hats off to the US lads who, the pundits are saying, are the fittest, most athletic team they’ve ever seen. Sad that they’re going home. It was a good game. I didn’t think Team USA played as well as they could have. Belgium was clearly the dominant team that day. I hope they go all the way.